"It's like the Free version, but ON STEROIDS!" WANT A FLAT BELLY, BUT DON'T KNOW ANY GOOD WORKOUTS? Most people just know the "Basic Crunch" ... it's SO BORING and most people do it wrong. Ab Workouts will TALK you through lots of fun & effective exercises to get those abs in shape. 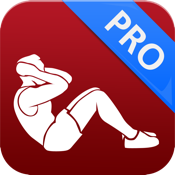 Lose weight, look better, stand taller, feel healthier and more confident with this simple, quality app. 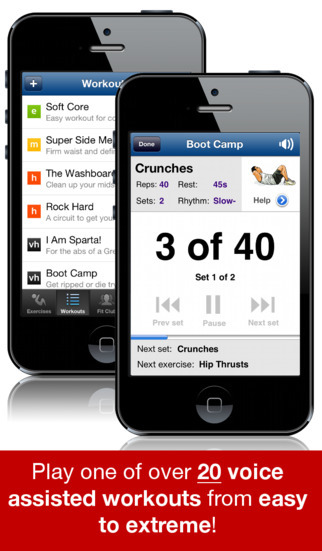 3) Press the 'Play' button & the app will TALK you through the workout - giving you encouragement and motivation as you go! This update includes our optional premium subscription service, fit_club! fit_club give you the information & motivation you need to get and stay fit and healthy. For only $3.99 per week, recurring, you'll receive daily tips, exclusive articles, motivational audio & video content and exclusive access to the fit_club members forum. Payment will be charged to iTunes Account at confirmation of purchase. Subscription automatically renews unless auto-renew is turned off at least 24-hours before the end of the current period. Account will be charged for renewal within 24-hours prior to the end of the current period, and identify the cost of the renewal. Subscriptions may be managed by the user and auto-renewal may be turned off by going to the user's Account Settings after purchase. No cancellation of the current subscription is allowed during active subscription period. Any unused portion of a free trial period, if offered, will be forfeited when the user purchases a subscription to that publication.